Syria’s Supreme State Security Court (SSSC) this week sentenced a 19-year old student blogger, Tal Al-Molouhi, to five years in prison - allegedly for spying for a foreign government. Her sentencing came just two days after sharp criticism by the U.S. State Department. Last week, spokesman P.J. Crowley called the charges against al-Molouhi “spurious". He called on the government of President Bashir al-Assad to release all prisoners of conscience and allow Syrian citizens the right to free expression. Al-Molouhi was arrested in December 2009 and held secretly for a year. Her trial took place behind closed doors, so few details of the case are known. Syria’s SSSC is not part of the country’s regular criminal justice system. The New York-based Human Rights Watch says the SSSC functions only to silence those who criticize or threaten the Syrian government. Defendants sentenced by the SSSC do not have the right to appeal their verdicts. 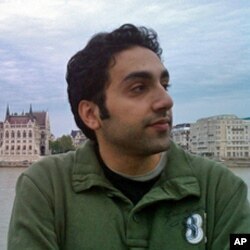 Anas Qtiesh is a Syrian blogger and activist. He is also an editor for Global Voices Online. Hilleary: What do we know about her case--and just how typical is it in Syria? Qtiesh: Her unfortunate sentencing is definitely the norm in Syria for people who are perceived to be online dissidents. Other bloggers or online journalists have received sentences of between three and five years in the past, so her sentencing is typical. And even the period in which she was held incommunicado – we’ve seen it before with other Syrian bloggers such as Tariq Biasi. Hilleary: What kinds of restrictions do Syrian bloggers face? Are websites monitored? Qtiesh: Oh, absolutely. Public web cafes are required to copy information off of photo IDs of people who wish to use their computers to get online. They are provided with monitoring software by security agents. And bloggers have been arrested through being monitored through these programs. So even though Facebook is open and YouTube is open, it’s just an intelligence-gathering tool. Hilleary: What about your own experience blogging in Syria - how careful did you feel you had to be? Qtiesh: In Syria, unfortunately, the “red lines” are not clear, so you don’t really know exactly what is okay and you’re always worried that what you write might or might not put you in trouble. So this promotes common sense or practice of self-censorship. You have to make a conscious decision whether you want to use your own name or just go with a pseudonym online, which a lot of bloggers feel affects their credibility. So they prefer to use their real names and just suffer the consequences--which unfortunately happened to Tal al-Molouhi. Personally, I tried to push the line a little bit. I was writing in English, so I felt a bit safer. But I wrote against online censorship and I promoted tools to circumvent the censorship. Hilleary: Recently, [Syrian] President al-Assad told the Wall Street Journal that he would be pushing through some reforms--among them, a new media law. What kind of laws are already in place and what would change? Qtiesh: The current media law does not apply to the internet. It’s archaic and basically just enforces a pervasive level of censorship. They talked about a new media law, but I see it as just extending those same controls to online platforms, whether it be news websites or even blogs and social networks. Hilleary: Recently I read - in your blog, as a matter of fact--that Syria’s Telecom Minister, Imad Saboni, was calling for an end to internet censorship. How did that go down in government circles? And is this a sign of division in the government on these issues? Qtiesh: In Syria, Ministers of Telecom come and go really fast, compared to other ministries. The situation is that the Ministry of Telecom does not have a say in what websites get censored or not. I don’t know if it signifies division or not, but I think it basically signifies that some people who are part of the government oppose the censorship and see it as ineffective. And it actually is, because everybody can just go around it. There’s just this inner conflict between the Old Guard, who are set in their ways with monitoring and censorship, and people who see that these methods do not work in this day and age. So it’s definitely signifying a transfer in the mentality and way of thinking in the government. And we might see some more changes soon. But unfortunately, what we saw with Tal al-Molouhi makes me a little pessimistic about the possibility of this happening as quickly as needed. Hilleary: Can the US play a role in helping to secure some of these reforms? Qtiesh: Syrian internet users suffer daily from the US sanctions. Some very basic software that is necessary for everyday use is blocked due to the sanctions. Software such as Google Chrome Browser or Google Earth and necessary software that you need to run a computer properly and have a complete online experience that allows you to express yourself, to get information, to get education online. And continuing the sanction policy is definitely harmful to the people and it certainly does not help with the anti-American sentiment that the US is definitely trying to combat.